The bag is specially provided for game card of white black board game. Large capacity and divider design make various of cards orderly and convenient to carry when you travel. 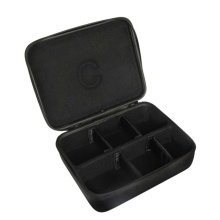 Unique design holds all cards with large storage space for cards, including 5 removable dividers. Hard outside and soft interior with zipper design enlarges the storage space and keeps all cards safe. Convenient hand strap for easy carrying. Black color, not easy to dirty. Can also be used for any playing cards.